My experience with a 6BR. Bet you cant guess what platform I decided to use for a 6BR well you have to work with what you have so I used my T/C Encore frame. I have been on a quest for accuracy for some time now and have fulfilled my accuracy needs pretty well with the various .17s. After reading some good things about the 6BR, I found myself wanting one for my encore frame. I purchased a stainless 26" barrel in this caliber from Virgin Valley Custom Gun a few months back and put it in the back of the safe. I gradually gathered the components needed to shoot this gun including the dies, bullets (not used to such big bullets), powder, scope, and load information. It took a couple of months to gather all of the necessary stuff but I managed to obtain all of the essentials in a few months time. I chose to load some rounds for it using a couple of different powders. The first time out to the range was a success and I knew that I was going to like this barrel. The powders that I tried were Vihtavouri n133 and Accurate Arms 2015. I had gotten some H322 that I intended to try as well, but didnt find the need to experiment further after getting the desired results with the AA 2015. I found that the load that I had the best luck with was at the book max value, but the velocity for the load was somewhat anemic. 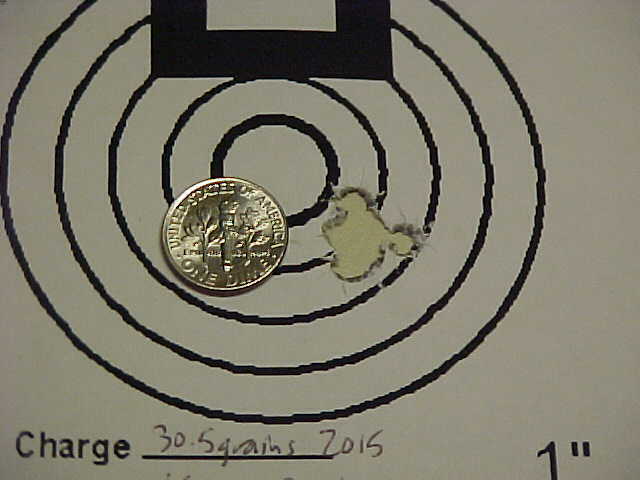 The load that I have settled on is 30.5 grains of AA 2015 behind a 65 grain Starke which chronographs at 3250 fps. Anemic or not, this is what I am using. Below is a picture of a couple of groups shot with this combination. 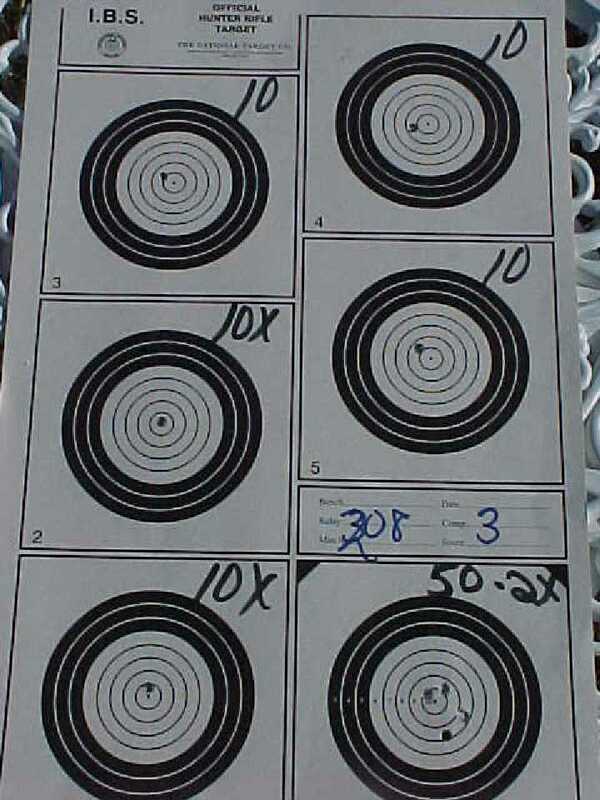 I am pretty happy with these groups, but may change my opinion as I start to shoot my benchrest gun in 6PPC. These groups were both shot without the use of windflags, shame shame. I recently acquired a benchrest rifle and was planning on attending an IBS match for score. I hadnt received the rifle but still wanted to attend the match so I took the 6BR. I was also out of the Starke bullets that I had developed the load for so I substituted some Gentner 65 grain match bullets that I had gotten for my benchrest rifle. I hadnt had a chance to try them at all before the match and the first time that I shot them was during the open range to sight in. These bullets shot to the same POI as the Starkes and seemed to perform equally as well, which should be of no surprise to any of you who have used Gentner bullets. This was my first match and was a learning experience. I was a little apprehensive about shooting the 6BR in the match considering that every other gun on the line that day was a benchrest rifle. The conditions were less than ideal (read very windy) but I was able to put the bullets into the desired location more often than not. I managed to score a 233 4x for the day. I managed to finish dead last (not including the individuals that decided to pack it in) but was still very happy with my effort. The winning score was a 249, so nobody finished clean in the conditions. 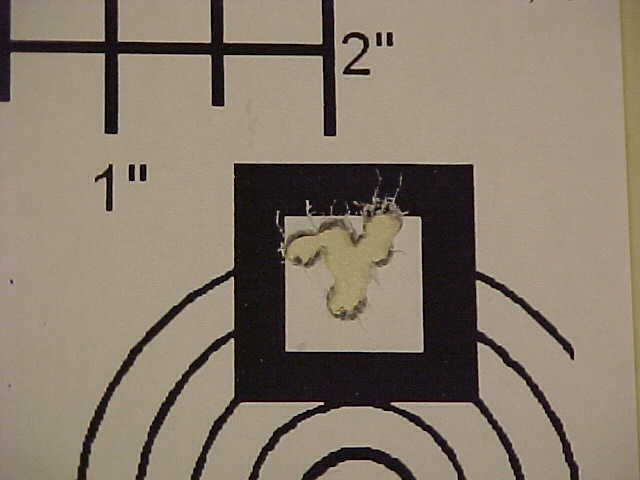 I did have a clean round with a 50 2x which is shown below. I met my personal goals for the match and look forward to future matches. Bottom line, this barrel shoots great and if I read the flags well enough, it will put em in the 10 ring. I met a lot of great people at the match and received plenty of help. I even got a few compliments on the encore (Thank you Bullberry for the terrific stock set). One gentleman a couple of benches down reminded me that I was not allowed to come to the line until I opened the bolt on my gun. Not realizing that I was being teased initially, I was not sure how to respond until I looked over and saw him grinning. I then responded that he had to disturb his gun in the bags between shots in order to even things up since I was having to deal with a break action. Come to think of it, he should have to adjust his trigger to 2 pounds also, and maybe put on a 16x scope. All in fun and I have found that to be the standard with the benchrest community thus far. I had the opportunity to shoot a BR gun in the last round. One of the guys that I met that day offered to let me shoot his BR gun and I took him up on the offer. I was glad that I did, and it made me even more anxious to receive mine. That is the first time that I have ever looked in a 36x scope or touched a 2 ounce trigger. Wow, is all that I have to say about that. Of course, I had to deal with some serious switch winds and couldnt catch my condition. I went back to the sighter on several occasions and was only able to score a 47 1x in that round. I hope to include a picture of me on the line with my encore, this was taken by my coach Craig Kostyshyn who finished 3rd for the match. After he gets the pictures developed, I will scan one in to post here. He has helped me enter the BR world and has been very helpful in shortening the learning curve. His score for the day was 248 7x. Second place was 248 11x. As I write this, I am to receive my BR gun from the FFL today and am growing very anxious. It is mothers day weekend and I can only hope to find an hour or two to sneak off to the range probably will have to wait a few more days.